I suggest when reading Cold Kiss you have a box of tissues sitting right next to you. I've never read a YA book that actually made me cry as hard as I did reading Cold Kiss. It made me cry at the beginning and at the end. 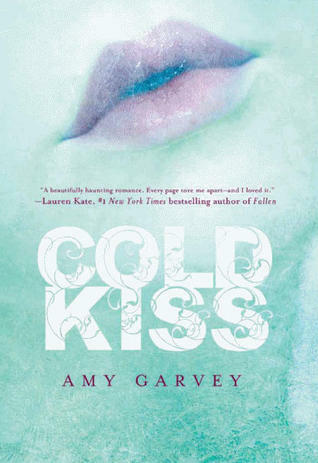 Cold Kiss is about a girl named Wren who falls in love with a boy named Danny, only to lose Danny in a nasty car accident. Not being able to let go and move on, Wren finds a way to bring him back. She always knew that she was different somehow. Not just her, but her family as well. After going through a bad time with her father leaving them, Wren wasn't ready to let go of Danny too. So she uses a little magic and brings Danny back. From there on you continue to read the struggle Wren has with letting go and moving on. She loves Danny with every single piece of her heart, but she also knows what she has done is wrong. Cold Kiss broke my heart into a million pieces and then put it all back together with the ending. Amy Garvey's writing will touch you and give you goosebumps. She is so good at describing emotions, that you can feel exactly what the characters are feeling. Now I know some of you might be thinking, "Well, why would I want to read a book that will make me cry?" Trust me, it is so much more than that. It made me cry, smile and laugh. Cold Kiss is a beautiful story about love, family and friends. I am so sad it is over, but I am also very happy I got the chance to read it. I don't know if this is going to be a series, but the way it ended left it open for a possible second story or just for a stand alone. A MUST MUST MUST READ! This is the first review I've read for Cold Kiss, and it sounds like a really great, emotional read. Thank you for sharing your review, I'm looking forward to read this! Christy, please, if and when you read it link me to your review lol. I love books that make me cry! Great review. Thank you Jennifer! I really hope you like it! Great Review, I am adding to my wish list!!!! I'm reading this right now! It is really good! wow, this is such an awesome review! I really want this book now!! Hmm, certainly sounds interesting and unique. I'll certainly pick it up when it's released! -I need to read this book! I know I shouldn't be so excited because this book made you cry, but that's exactly why I want too! It's hard for books to make me brawl my eyes out. Plus, this book does sound really interesting. Wow, great review. Sounds like a book I would so love! :) I have it to read for review on NetGalley. I should read it soon. Damaris I love your review. You got exactly how I felt after I finished reading this book. I broke my heart, but it was so worth the read. She brought you through the emotional ringer. Thanks.